Admitting the problem is the first step. Except here is the thing: I don’t want to get over this. I just want the PBS miniseries “Downton Abbey” to go on and on forever. I don’t want to recover. I don’t want them to stop writing scripts. Prequel, sequel, I don’t care. Please: don’t let it stop. Sunday from 8-10, I am not available. No. Matter. What. 1. There is no way to get enough of Maggie Smith. She is one of the greatest actresses of all time. No one can say “Dreadful!” the way she does. Don’t even try. Watching her is actually good for you if you are weak with a comeback. The next time someone says, “I am afraid I won’t ever see you again,” study her, and say, with a sweet little smile: “Promise?” All theater students should watch this show for all of the actors, but she is hard to beat. And if you want to write, you would have a hard time finding better dialogue. For example, when they thank Cora’s mother, played by the inimitable Shirley Maclaine, for all the American dough she has sunk into the Downton Abbey estate, she says, “Well, you have to spend it on something.” The dialogue is so good because it fits each character yet still maintains an element of surprise. 2. Life is unfair, and this show has a healthy dose of justice. Corrupt servants get their comeuppance, love that is derailed gets back on track, and even though in America all we remember when Bates was still rotting in jail, we spent a long time hoping that he would get out. (Didn’t you love those shirts that said, “FREE BATES”?) At least at Downton Abbey, there is always hope. Things go wrong, but things also go right. I know: the latter is addictive. 3. This show will help you understand realism. That is because I am teaching a course called “Realism and Naturalism,” and that is my story and I am sticking to it. Actually, it is amazing the way Julian Fellowes has taken history and a real castle (Lady Fiona Herbert, The Eighth Countess of Carnarvon, still lives there with her husband) and made it into the most engaging television in years. As the advertisement tonight reminded us, “There are football widows and there are Downton Widowers.” Oh well. But the attention to detail is what makes this great realism….you really do feel like you are there petting hunting dogs, having your hair curled, opening mail that ruins your life WITH A LETTER OPENER, caring that the chandelier has been properly dusted for your uber-important dinner party, even if you are really in your jeans, eating popcorn, and wondering why Madonna thought she could ever pull off an authentic English accent. In that house alone, there are 27 variations of English accents, not to mention the Irish chauffeur who has managed to marry Sybil, one of the Grantham daughters, thus horrifying everyone. It is so realistic, in spite of some implausible plot lines, that when you meet a true addict, they will refer to the characters as if they were real people, who really exist, and talk about them as if they are his or her friends. If I ever get married again, I hope Carson can see me in my dress like he saw Mary, and that I can wear hair jewelry and talk about it with Edith. I sure hope she gets nicer once she marries that old aristocrat, and I need to tell her not to copy Mary’s dress. 4. This show can help you learn more. For example, you could expand your Downton Abbey studies and do a sociology dissertation on American heiresses marrying European aristocrats. You could use that book called To Marry an English Lord, which was written by a real historian, and make it legit. Or, you could read Edith Wharton’s unfinished novel called The Buccaneers, which is about the exact same thing. No worries if you cannot get enough, Marion Mainwaring finished the novel for her, and they even made a miniseries out of it. See, this is very intellectual. Now could you move a little to the right? I cannot see Mary’s going away outfit. Thanks. 5. If you cannot get enough of the show itself, right after you can watch a talk show about the show with people who will go over what you just saw. It is just like those sports shows where the sports analysts explain the game that was just played. But it is so much better because in sports it is so predictable because one team will win, and one team will lose, and it will be that way forever. But in Downton Abbey, there is always another exciting episode in which you don’t know what will happen, because just when you think things are going swimmingly, something goes wrong, I mean way wrong, and before you know it, people have been slipped mickeys, people lose fortunes, people make ridiculous decisions with inheritances, fashions, and where to eat during an indoor picnic. And there are innuendos. That NEVER happens in sports. 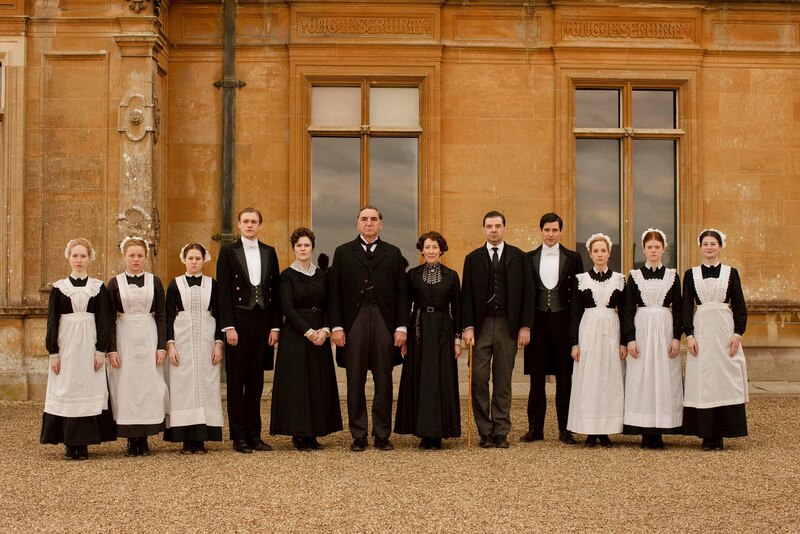 Once you catch the Downton Abbey fever, just know, there is no known cure. In fact, instead of rehab and support groups, there are just enablers everywhere you turn. You can even go on Facebook after the show and find Facebook.com/ManorSpeak and talk about it until you just cannot say one more thing about what you think about this show, and the best thing is no one can stop you. I know how to DVR, and I have the PBS 800 number to order past seasons, even though I pretty much have them memorized. I can handle real life and Downton Abbey. Really, I can. Just move away from that cream because I am getting ready to put it in my Earl Grey tea. Don’t judge. My name is Doni, and I am a Downton Abbey addict. Alright. You’ve convinced me. Hello Downton Abbey, goodbye regular sleeping schedule. You’re so right about Maggie Smith. Doni, you know I love you, and I too am addicted to Downton Abbey — but not because it’s realistic! In fact, just because it’s not. And the writing is NOT good — honestly, much of the dialogue makes me cringe. But I’m no less passionately with you there on Sunday nights, clutching my bowl of Trader Joe’s white cheddar corn puffs. Heidi–I still think Downton Abbey is delicious! ;-)). If you love Downton this much, you should try another Masterpiece series (that I think is BETTER than DA– are you going to brand me a heretic?) from a few years ago called “Lark Rise to Candleford.” It is much more leisurely paced, which makes for deeper character development. The actor who plays Mr. Bates is in it, and he is so wonderful. “Cranford” and “Return to Cranford” are also a delight. Thanks, Patti–I will definitely check it out! I love these period pieces–it is easy to get all caught up in them! I love the Cranford series as well. I thought it was well written and great character development. I don’t think I saw Candleford – I will check it out. But, I absolutely adore Downton Abbey! I just started watching this last weekend. Addicting. Watched the entire First Season in a day and a half. The Second season is scheduled to be released on NetFlix February 7 — I am not sure I can wait that long but I am trying to keep myself busy with other things — drinking tea, writing letters and hiring a valet. In saying that I must withhold from reading anymore of this piece until I am caught up. Bates is in JAIL?! Oh yes, Bates is in jail. And. it. is. soooooo. wrong. ;-)) Thanks for reading–so glad you are watching! I saw one episode while visiting my mother-in-law…now I’m on the library’s list waiting to rent them. I love the show as well. Wish you had skipped the spoiler! We don’t all watch live in the present. I’m not sure I agree with you about sports. At its best the next game or the next season provides in the next game, or the next season, exactly the kind of hope, unpredictability, promise and even perverseness that you describe so well. Hey Doni! I loved your article! And I agree about Maggie Smith. Watching her (and the show) is an amazing cure for the winter blues! I hope to talk to you soon–you can always make me laugh with joy (and not that many people can!). Try Flambards (BBC Miniseries from 1970’s or so) for a similar period flair with all the wonders you could imagine including charming music, the invention of the airplane, WWII, etc. Oh yes, it ripped love to pieces, but it made more sense. It was war.